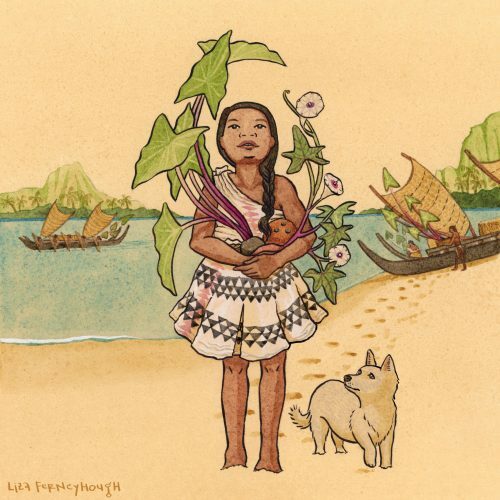 An illustration for my agency newsletter on the theme “beginnings”: an ancient Polynesian girl arriving for the first time at a new island, her arms full of canoe plants. Canoe plants were a set of about 20 or so food plants that the Polynesians took with them in their canoes and propagated all over the Pacific. They include taro, sweet potatoes, coconuts, yams, and breadfruit. Her dress is made of mulberry barkcloth – essentially paper! She’s also with her poi dog, which were related to dingoes but are now extinct. They were pot-bellied dogs evolved to eat poi and take care of children. A lot of internet descriptions of them are rather dire (they were fairly dim and as likely to play and sleep with the tribe’s children as they were to be eaten by them), but I think they sounded kind of sweet. This picture was inspired by my recent (40th!!) birthday trip to Hawaii.